At least 27 people were killed Friday in airstrikes by allies of the Syrian government on the rebel-held area of Eastern Ghouta, following a breakdown of talks, a monitor reported. [post_ads]At least five of those killed were children, the Syrian Observatory for Human Rights reported, adding that the 40 airstrikes in two hours were believed to be carried out by Russian fighter planes. The airstrikes Friday on the Damascus suburb were the first attacks since negotiations over a possible civilian withdrawal began 10 days ago. The Syrian government has bused willing evacuees from the area since March, but members of the Jaish al-Islam resistance group have refused to go. Syria and Russia threatened to resume bombing the town if the group failed to leave. 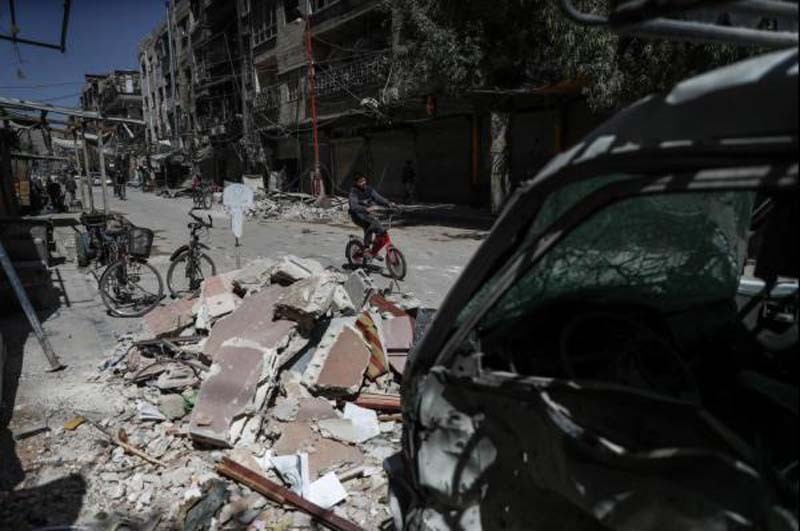 Negotiations broke down on Thursday, the government-owned Syrian Arab News Agency reported. The deal calls for Jaish al-Islam to leave the city of Douma to allow government agencies and institutions back into the city and for weapons to be handed over to the Syrian state. Douma is the last enclave in the Eastern Ghouta area of suburban Damascus still under rebel control. Nearly 3,000 rebels and their families have recently left Douma, the Syrian-run news agency reported.